Futuristic looking black and orange Acer Predator AG3-605-UR1D desktop was released recently as part of the Predator G Series, mainly for the ultimate gaming performance and the best entertainment options with a super powerful Haswell Intel i7 processor and the advanced NVIDIA GTX760 graphics card. 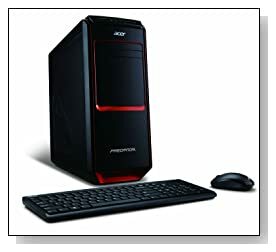 Acer Predator comes with the 4th generation Intel Core i7-4770 quad core processor at 3.4 GHz speed (6 MB total cache) with turbo boost technology that takes the speed up to 3.9GHz, 12 GB DDR3 RAM for the smoothest multitasking, very high system speed and the super fast frame rates in games, 2 TB SATA3 hard drive at 7200 rpm spindle speed + AcerCloud for easy access to your important files anywhere and anytime as well as the 64-bit English Windows 8.1 operating system as a stable platform for games, multimedia editing or anything you do on a day-to-day basis. It has the frame-dominating NVIDIA GeForce GTX760 discrete graphics with a 1.5GB of dedicated video RAM for an incredible gaming performance and the most stunning graphics with cinematic visuals and the High-Definition 5.1-Channel Audio Support for realistic sound effects to be in the heart of the action, so this is quite an advanced multimedia centre. Intel i7-4770, 12 GB memory and the GTX 760 graphics give you all the power and speed you need to play the latest games at the highest settings, edit complex multimedia and perform your daily tasks very efficiently. 2000GB HDD is massive amount of storage space for all your videos, photos, common files and games. Black and orange Acer Predator weighs 33.1 lbs with dimensions of 16.93 x 7.09 x 17.24 inches. It is designed to be very user-friendly, with an ergonomic handle at the rear to be able to move the machine to the front easily and with the convenient location of SD Card, USB ports and audio jack at the top. Connectivity options include 802.11a/b/g/n Wireless LAN, Bluetooth 4.0, 10/100/1000 Gigabit Ethernet LAN with RJ-45, 8X DVD-SuperMulti Double-Layer Drive, 4 x USB 2.0 ports (2 front and 2 rear), 4 x USB 3.0 ports (2 front and 2 rear) that help download a 25GB video in only 70 seconds, a Digital Media Card Reader, an HDMI port for the best of home theatre on your large screen HDTV with a single HDMI cable for audio and video, 2 x DVI ports, USB Keyboard and Optical Mouse. Conclusion: Acer Predator AG3-605-UR1D is the kind of computer that will make playing games a totally different experience. It comes with the top of the range specs and features for super performance in everything you do, handling demanding multimedia tasks like heavy video editing and the most advanced 3D game titles like Battlefield 3, Shovel Knight and The Wolf Among Us: Episode 5- Cry Wolf at the highest settings at high resolutions thanks to its super GeForce GTX 760 graphics card with 1.5GB dedicated memory, the Intel i7-4770 CPU with great clock speed up to 3.9 GHz and the massive 12GB RAM that can even be upgraded up to 32GB. If you’re in the market for a very powerful advanced desktop PC with great performance levels, this gaming machine is definitely worth having a look. 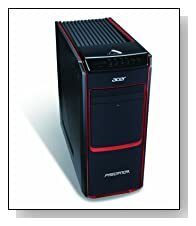 It is also offered with a limited 12 month warranty for parts and labor and Toll Free Technical Assistance by Acer.